Mother's Day is on it's way and you are desperately trying to think up a gift that will outdo the one you gave her last year. 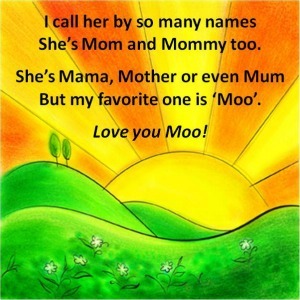 As a mom myself, I know that even a scribbled piece of paper with the words 'I love you Mom', (my daughter puts that on every art she creates) will bring us to tears and make us oh-so-happy. 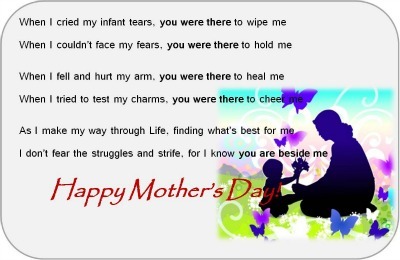 But again, as a mom myself, I better understand and appreciate my own mom. And at this stage in life, I cannot simply give her a scribbled piece of paper anymore. 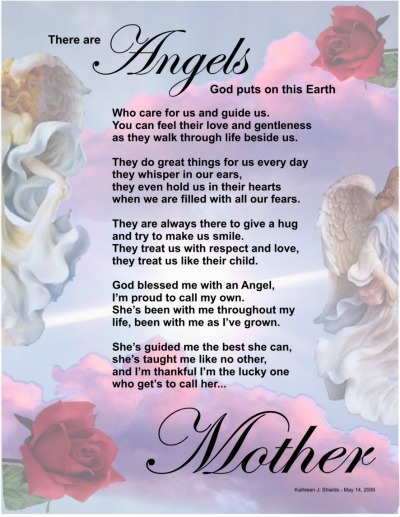 Here's a special poem I wrote for my Mom...Love You! Most of the time, we are so busy being a mom that we don't even catch a glimpse of us in the mirror (which might be a good thing on some days, if you know what I mean!). On this special day for mothers, why not give her the gift that will remind her that she is also a woman...a much loved, appreciated and cherished woman. Home made gifts make for great Mothers Day ideas. 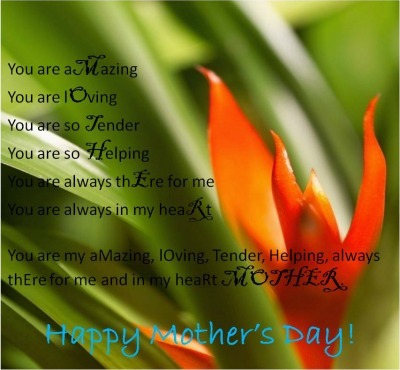 Print out and add a special Mother's Day poem dedicated to her and you can expect to enjoy another full year of yummy mummy cooking! There are also special Mothers Day deals offered by various stores. We have listed some at the bottom of this page so you can pick out some great Mothers Day gifts right here. 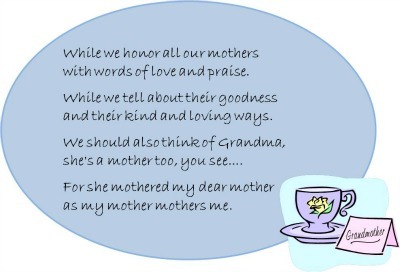 I have for you a collection of poems that you can print and give to your mom, mom-in-law (yes, I have included her in this) and grandma too. Being a mother is such a beautiful experience. 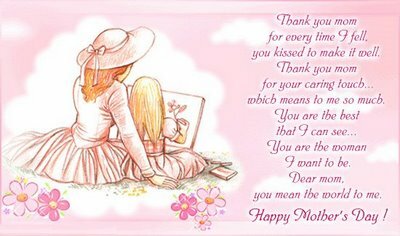 Mostly mothers do not really expect anything back from us, other than the occasional hugs and kisses. Deciding on a gift for a person who just wants to see us smile and who will go to drastic lengths to protect us, is a daunting task. Try to add something personal to every gift you give. Here are some home made Mothers Day Ideas for gifts. Mothers Day Newspaper - Plan on giving her breakfast in bed? Add a little something extra by slipping in this Mother's Day newspaper beside it. Rent her favorite movies and hold a movie marathon in her honor. You could even create a red carpet event by having her dress up like a star with you all the paparazzi! If you are a craftsy person, you can try out these tissue paper posies (very simple to make really) and fill the house with the flowers. You could even spray perfume on them to have the entire house filled with fragrance. Use an empty wine bottle, polymer clay and spray paint to create unique flower vases - Emily over at Busy Mommy shows you how. Take a look at these tile coasters - easy, simple and so beautiful. I am definitely going to try this one out. Thanks to Lindsay of The Cottage Home. Green Wedding Shoes might have had this idea with the wedding couple in mind, but I think this ever so easy String Heart Art will make a wonderful home made gift for Mom too. Special note to all those absent-minded husbands: Take an active role in helping your kids select the perfect gift for your wife. She IS the Mother of your children. And she needs to be reminded that she is also a beautiful woman. Go on, gift her a day at a spa while you babysit instead. So here is a toast to all the beautiful women in your life. 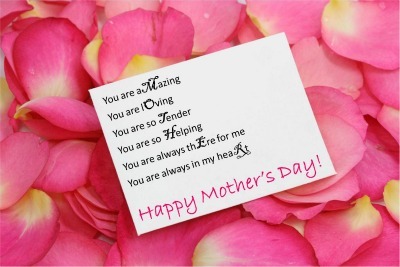 Most stores have special Mothers Day deals and guides to help you find the perfect gifts for grandma, mom, mom-in-law, new mom or even expectant mom.